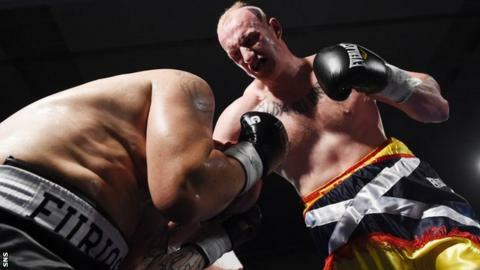 Gary Cornish went against his manager's advice to take on Anthony Joshua in a Commonwealth heavyweight title fight both will enter with unbeaten records. The pair will meet at the O2 Arena in London on 12 September. Tommy Gilmour, Cornish's manager, said: "If he had listened to me, I would like to have seen it happening in 2016. "But the fighter himself talked me into the fight as he said he wanted it because he wants to be the first to beat Anthony Joshua." Scot Cornish, 28, is the unbeaten IBO intercontinental champion and has won 12 of his 21 fights by knockout. Englishman Joshua, three years younger, has won all 12 of his professional fights by knockout since winning the Olympic title. "It is certainly his hardest challenge to date," Gilmour told BBC Scotland when asked about the task facing Cornish. "You can't go higher than the Olympic gold medallist and somebody who's stopping everyone in their tracks. "It is a huge step up in class for Gary, but it is something he's relishing. He really fancies the job." Promoter Eddie Hearn says 6ft 7in Cornish will present Joshua with a different kind of challenge. "Of course, the hype around Anthony Joshua just now is phenomenal, but we're still at the early stages and in Gary Cornish, you've got a fighter who believes he can win, will try to win and it will be a very interesting fight," he said. "The one thing that Anthony hasn't done in his career is box someone big and heavy who can really hit." Before Monday's first joint media conference involving the two boxers, Hearn suggested the winner will go on to challenge Dillian Whyte for the British title. "They're talking about Tyson Fury or Wladimir Klitschko, but we're not there yet and this is by far the biggest test of Anthony's career to date," he said. "He's a very humble guy and he knows the threat from Gary Cornish: he's a huge man and he punches very hard and it's his first major title fight. "It is very important to both guys' careers and it's great for boxing that two undefeated heavyweight prospects are willing to put it on the line."